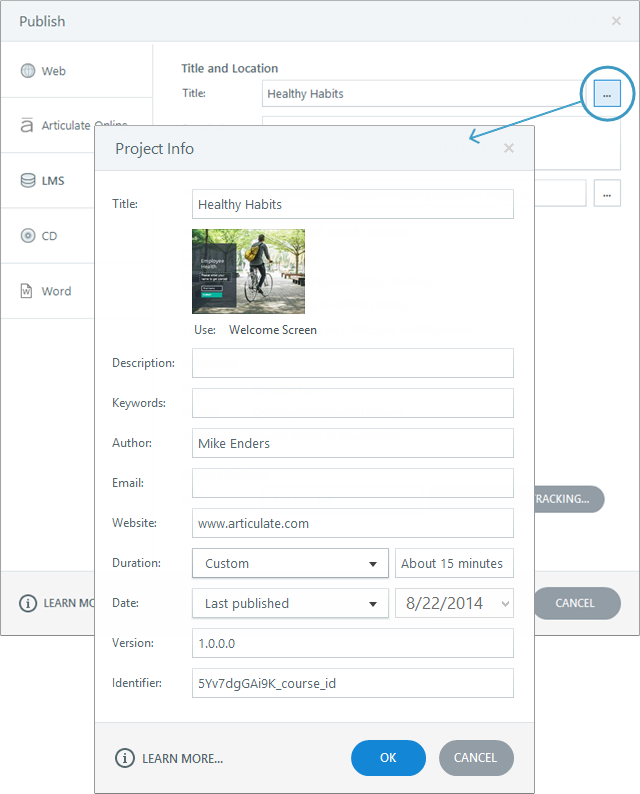 If you're using a learning management system (LMS) to deploy and track e-learning content, you'll want to use the LMS publishing option in Articulate Storyline. Use the Description field to give learners a synopsis of your course. Currently, the course description only appears on information cards in the Articulate Mobile Player app. Important: Always publish to your local hard drive. Publishing to a network drive or a USB drive can cause problems with your published output. 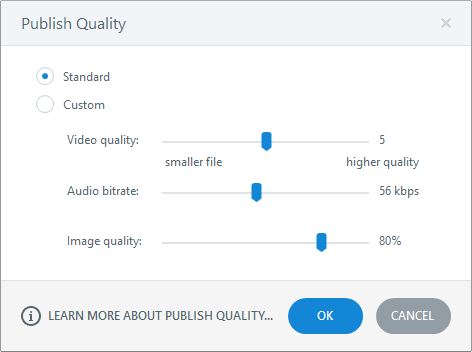 After publishing to your local hard drive, upload the output to a web server for testing. If learners will view your content on iOS devices with the Articulate Mobile Player app, you can add more project information by clicking the ellipsis button (...) next to the Title field, which opens the Project Info window. The Title and Description fields are the same as those on the Publish window. The image below the Title field will be the course thumbnail in the Articulate Mobile Player library. By default, Storyline uses an image of the first slide in your course, but you can choose a different image. Just click the blue slide title text, then select a different slide or click Picture from File to choose an image on your hard drive. The Identifier field is a unique string of characters assigned by Storyline. Your LMS uses it to identify your content. If you're republishing a course that's already in your LMS, don't change the value in this field. If learners will view content on a device that doesn't support Flash, like the iPad, use the following options to make your course viewable in HTML5, the Articulate Mobile Player app, or both. Include HTML5 output: This prepares your course so that it's viewable as HTML5 content. Bear in mind that not all web browsers handle HTML5 content equally. See this article for supported HTML5 browsers. Use Articulate Mobile Player for iOS or Android: This prepares your course so learners have the best possible viewing experience on iPads and Android tablets, using Articulate's free mobile player app. 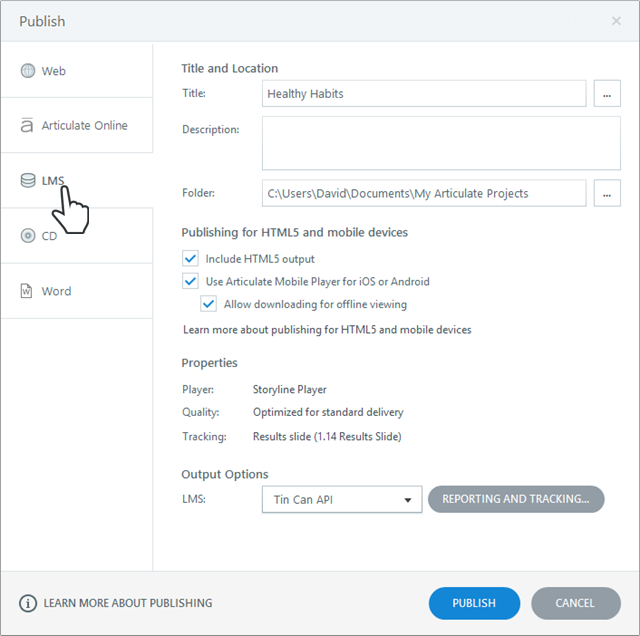 Important: Tracking content in the Articulate Mobile Player is only supported in learning management systems that support the Tin Can API specification. If tracking and reporting is crucial to you but your LMS doesn't support Tin Can API, don't mark this option. Allow downloading for offline viewing: This option isn’t currently supported for LMS content. Learners who attempt to view an LMS course offline will be prompted to reconnect to the Internet. 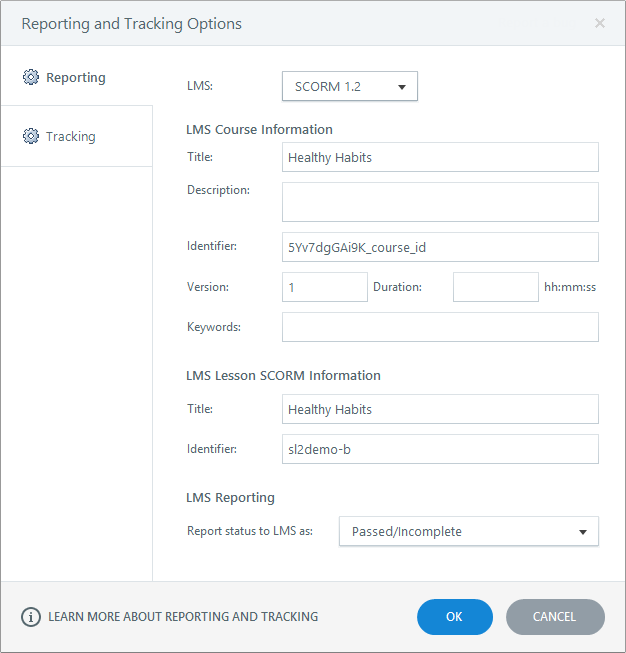 In the Properties section of the Publish window, click the Tracking field to open the following window, where you can choose how your LMS tracks and reports your learners' progress. Select a specification from the LMS drop-down. Ask your LMS administrator if you're not sure which to use. Storyline supports Tin Can API, SCORM 2004, SCORM 1.2, and AICC. If you've chosen Tin Can API as your reporting specification, you'll see a field called Launch URL. Enter the full URL for the story.html file if you plan to host the content on a server that's separate from your LMS. Typically, you'd host your content on a server separate from your LMS if your LMS supports the Tin Can API but hasn't yet allowed private content authorization for mobile apps. Find out more here and here. If the window includes a section called LMS Reporting, choose the wording you'd like to use to express learners' statuses. 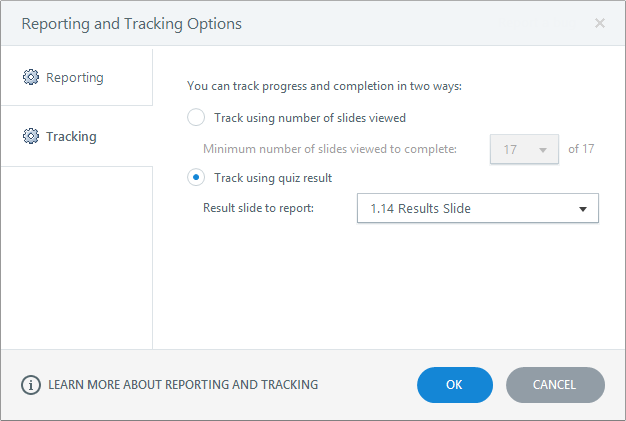 Track using number of slides viewed: Use this option to specify how many slides learners need to view in order to complete the course. View Project: This launches your course in your web browser. However, it's best to upload the published course to your LMS for proper testing. Email: This opens up a new email message with a zipped file of your published output attached. This might be helpful if your LMS administrator will upload the published output to the server for you. FTP: This opens a window where you can enter your FTP credentials and transfer your output to a server (which isn't something you'd typically do if you've published for LMS). 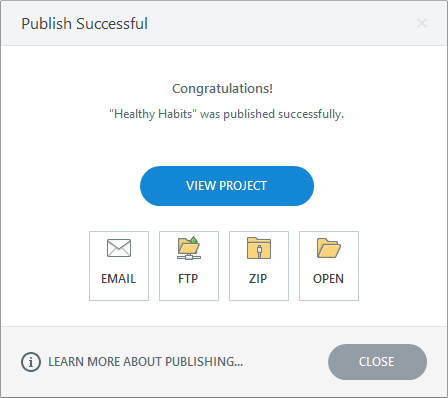 Zip: This creates a zipped file of the published output in the location you specified on the Publish window. This is the most common choice when you're using an LMS. Upload the zipped course to your LMS. Open: This opens a file viewer where you can see the files Storyline just created. There will be several folders and files that are needed to play your course. Tip: If your LMS requires that you identify the file that launches your course, point to index_lms.html for SCORM/AICC content or story.html for Tin Can API content. Now that you've published, it's time to upload the course to your LMS. The steps for this are slightly different for each LMS. Ask your LMS administrator if you need help uploading, launching, or tracking content. When learners launch your course, they'll see the right type of content based on the device and browser they're using. They'll see the Flash content if using a browser that supports it. If they're using an iPad and you didn't mark the Articulate Mobile Player option when you published, but you did include HTML5, they'll see the HTML5 output in mobile Safari.